Al Hanser, Chairman and Founder of The Sanibel Captiva Trust Company addresses shareholders during the 2018 Shareholder Meeting. Shareholders listen to Tampa market Advisory Board Member, Jim Watrous during the meeting held at The Sanibel Harbour Marriott Resort & Spa. 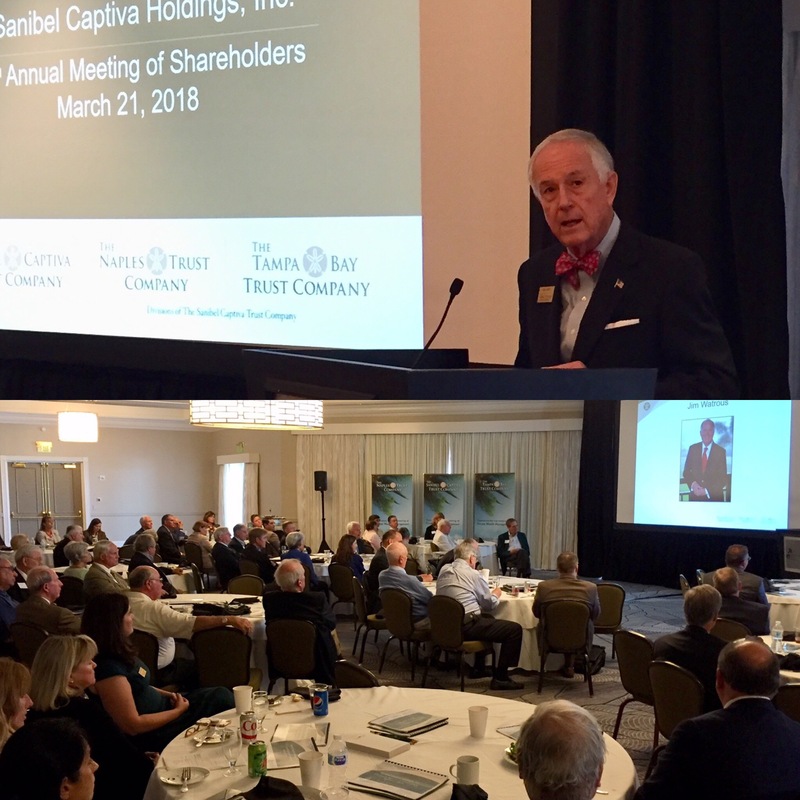 Sanibel Captiva Holdings, Inc. held their 2018 Shareholders Meeting on Wednesday, March 21st at the Sanibel Harbour Marriott Resort & Spa in Fort Myers, Florida. More than 70 people attended the meeting hosted by Founder and Chairman, S. Albert D. Hanser and CEO, Terence M. Igo. Hanser detailed company business, while Igo reviewed the 2017 financial results. Among his comments, Hanser noted, “We are fortunate to have such engaged advisory board members who are connected in their communities; provide productive observations and advice, and serve as company ambassadors. All three major markets of Sanibel-Captiva, Tampa Bay and Naples have active advisory boards in addition to a dedicated Board of Directors.” Board Member Richard Botthof, who was instrumental in developing The Naples Trust Company, a division of The Sanibel Captiva Trust Company, was celebrated and thanked for serving nine years as he officially retired from the board Wednesday. Currently, The Trust Company is comprised of 34 employees, all benefiting from the Employee Stock Ownership Plan that was established in 2015. The (ESOP) has positive growth due to thoughtful strategic hiring practices and efficient business management. It also demonstrates the company’s commitment to the employees and the desire to stay independent.